Following an exclusive deal back in September, MacRumors and Magix have again partnered to offer our readers an exclusive discount on the multimedia software maker's Sound Forge Pro Mac 3 bundle. 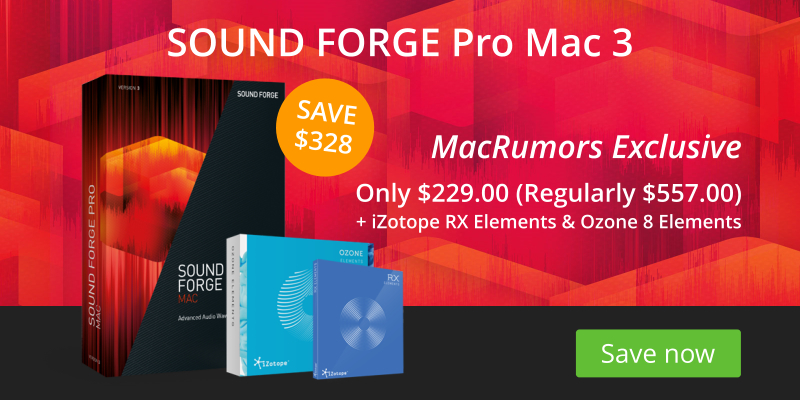 With the discount, you can buy Sound Forge Pro Mac 3 for $229, a $328 discount on the traditional price of $557. Our earlier discount brought the price down to $249, so the new sale is a chance to get the bundle for $20 cheaper. If you're interested, the exclusive discount will be available beginning today, November 8, and run through Thursday, November 30. Sound Forge Pro Mac 3 is an advanced audio waveform editor that has been optimized and designed for macOS, offering users multi-channel recording and editing, mastering for music and dialogue clips, and support for high-resolution audio recording at 24 bits with sampling rates as high as 192kHz. The suite's full features are extensive -- also including customizable window layouts, file conversion automation, and the iZotope's RX Elements and Ozone Elements tools -- so make sure to head over to Magix's website for more details. With just over two weeks until Thanksgiving in the United States, as well as Black Friday one day later, pre-Black Friday deals have begun appearing for many retailers. Best Buy has a plethora of discounts on Apple and Apple-related products that you can get your hands on right now, including sales on the iPad mini 4, 10.5-inch iPad Pro, select MacBooks, Philips Hue products, Apple Smart Keyboard, Apple Pencil, and much more. Best Buy's pre-Black Friday sale will last from November 8 to November 11. We've highlighted some of the best deals below, but if you want more information on all of the discounts be sure to head over to our full Black Friday Roundup, which also covers pre-Black Friday sales from all retailers in the lead-up to November 24. Adorama also has discounted multiple Apple products, with sales launching for iMac, MacBook, iPad, Apple TV 4K, and even accessories like the Magic Mouse 2 and Magic Keyboard. These deals are hitting below the listed price at other Apple resellers like B&H Photo and MacMall, leading to quite a few notable sales as we head into the holidays. That's particularly true of the accessories and new Apple TV 4K, which are discounted at Adorama from between $10 and $20 when compared to other retailers. For those interested, Adorama offers interest free financing through its credit card, with a few stipulations. You can find more information on the card here. There are plenty more deals going on in Adorama's sale, and other discounts circling this week, so head over to our full Deals Roundup for more information. If you're looking for pre-Black Friday and Black Friday-specific deals, don't forget to visit our Black Friday Roundup. Note: MacRumors is an affiliate partner with these vendors. Where are the discounts on the Apple Watch 3? The Sound Forge price is a great deal! One can only hope though, that they fixed the non-intuitive interface.